How Far is Sri Dhatri Dahlia? Standing tall in Alkapuri Township is the 'Sri Dhatri Dahlia'. Shrouded with greenery around, 'Sri Dhatri Dahlia' is built exclusively for you to suit the modern needs and requirements. 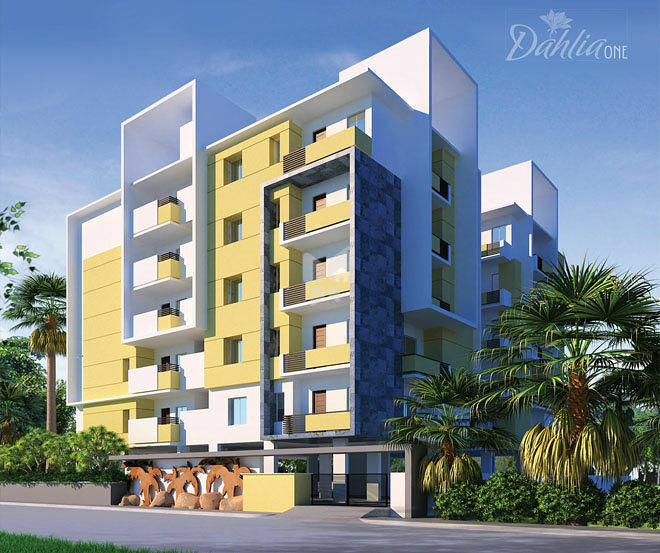 'Sri Dhatri Dahlia' has Three Bedroom flat of 1800 Sft East Facing and Two Bedroom flat of 1300 Sft North Facing. Amenities like Rain Water Harvesting, Parking Space, Children's play area ,Landscaping, Terrace and Green Spaces are being strictly considered whilst building the 'Sri Dhatri Dahlia'. At 'Sri Dhatri Dahlia', every detail is passionately considered with utmost importance.. Framed Structure : R.C.C. framed structure to withstand Wind & Seismic Loads. Super Structure : Red Brick 9" external and 4.5" internal walls. Internal: Double coat Cement Plaster with smooth finishing. Ceiling: Double coat smooth Cement Plaster finishing. External: Two coats plaster for External walls, RCC and Masonry surfaces. Main Door : ENTASAFE high secured metal,anti theft door. Internal Doors: MT wood frame with flush shutter with two sides veneer painted white,fitted with reputed hardware fittings. Windows: Three track UPVC window systems with clear glass of NCL WINTECH or equivalent make. Grills: Aesthetically designed bright steel safety grills with enamel paint finish. Internal walls & ceiling : Water proof putty finish with Two coats of premium Emulsion Paint of Asian make over a coat of primer. LIVING & DINING, BEDROOM & KITCHEN & BALCONIES : Vitrified tiles (24" x 24") - Asian/Johnson Make BATHROOMS : Acid Resistant & Anti-skid Tiles of Standard Make STAIRCASE/CORRIDOR: Combination of Green Marble or tiles of Standard make as per architectural design. UTILITY: Anti-skid tiles of standard make. Granite platform and stainless steel sink, separate taps for municipal water and bore well water. provision for fixing of water purifier, exhaust fan. All sanitary fixtures are of CERA/JOHNSON/HINDWARE or equivalent make 2 piece EVVC in all toilets. All CP fittings are chrome plated of CERA/JOHNSON/PLUMBER/JAQUAR or equivalent make. KITCHEN: Glazed tiles dado upto 2" height above kitchen platform. BATHROOM: Glazed tiles of standard make up to door height. MS Powder Coated Railing for Balconies. Power outlets for geysers and exhaust fans in all bathrooms. Power plug for cooking range chimney,refrigerator,microwave ovens, mixer/grinders in kitchen.Washing machine and dishwasher in utility area. Three phase power supply for each unit with individual meter boards. MCB's of reputed make for each distribution board. CCTV surveillance all over the project (Corridors and Parking area ). Note: Registration,Vat & Service tax will be paid by purchaser as per the government rules. Other than the above specifications will be charged accordingly with prior intimation. Sri Dhatri Constructions was founded and front-headed by Team of experts, whose passion and dedication towards construction business has earned them good reputation in the realtor fraternity. Sri Dhatri Constructions started operations a decade back, with a primary goal to bring high quality living and maximum customer satisfaction. And so, we at Sri Dhatri Constructions are proud of our success, as we have managed to achieve the needful. Team Sri Dhatri is well-equipped with individuals who are not only experienced but also knowledgeable. And therefore, we at Sri Dhatri know the ‘How and What’ when it comes to constructions. We at Sri Dhatri Constructions, are certainly proud of our expertise and specialization. Sri Dhatri Projects are HMDA Layout Approved.